Find out why Astoria has become the new location of choice for many. Amazing restaurants, cafes, & bars in walking distance. I live 2 blocks away if needed but will give you plenty of privacy. For security reasons please upload a CLEAR headshot picture in your profile. When making a holiday rental, I expect the descriptions of apartments to be accurate. I also expect the amenities to work and the place to be clean. With holiday rentals they are always the unknown until you arrive. On most occasions they are good (I use them a lot in many countries), however I can't say that for this apt. The lighting in the bedrooms was poor such that it was not really possible to do anything in there. There was a cockroaches infestation which was nothing like I'd seen before - I seemed to be spraying them all the time and still there were more. They seemed to be in everything, even the dishwasher (which leaked) and the fridge. The owner/manager must have known this was an issue as there were two cans of spray to kill them in the apt - perhaps prevention rather than a cure would have been a good strategy. All of the knives were blunt. There were no chopping boards. The internet speed was snail's pace (for the most part). The sliding doors in the wardrobe also were off their runners and hence did not work - I attempted to reinstall them, however they need new rollers or proper adjusting. Also, the apt was advertised as including an ironing board, which was not there. I asked Michelangelo to provide one to which he responded that he was overseas but would send his brother over with one. I waited in half a day and when it did not appear contacted him on several more occasions only to be ignored. I had to attend all my business meetings with non-pressed shirts, which was not the plan. On a positive note, the oven and microwave worked very well, the bathroom was reasonably recently renovated and in good order, however in what seemed to me to be common pattern of cost containment (refer above), the pièce de résistance was the 1 ply toilet paper!!! One ply - it is like using filo pastry, so I'm sure you get the picture. I did not even know 1 ply toilet paper existed until I unrolled it for the first time and wondered where its thickness had gone. Seriously? If you are going to charge market rates yet supply sub-market quality, don't expect good reviews. Nice quiet building in a great location. Close to restaurants and groceries. Very clean. My family and i decided on this place to vacation because we used to live around the corner and wow do we regret it. On the third day we saw roaches running across the dining room counter, and again the following day i killed one and have multiple pics of it and its quite large.i should have taken the hint when i saw 4 big bottles of roach killer in the hallway closet also have pics. We could not eat in the apartment because of this and trying to sleep with the thought of roaches running across my chest is disgusting and unnacceptable. i hope no family has to go through this again and ruin someone else's vacation. Do not rent here!!!!!! Shower drained so slow we had to stagger showers, great location.Needs more pillows. Wish you would have told me about the drain. I could have come to fix that easily. Did you see the extra pillows under the sofa bed? 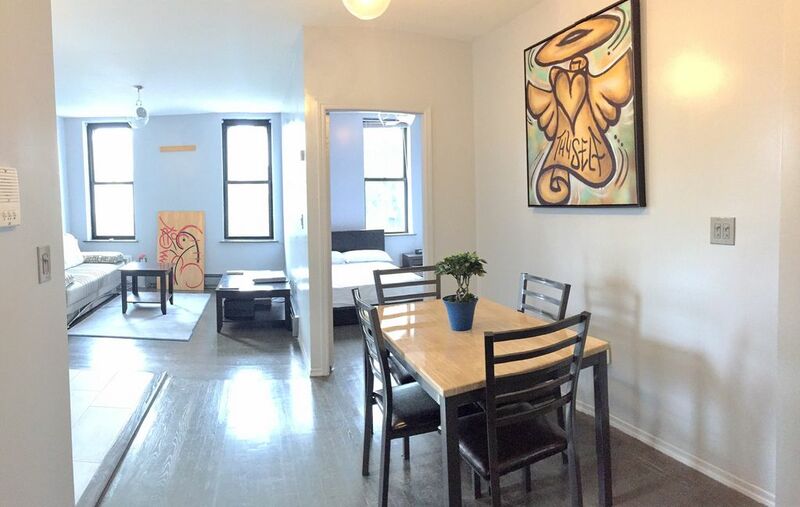 Fantastic apartment just a few metro stops from all NYC has to offer. Safe and quiet neighborhood with tons to offer nearby. If you are are looking for a bit more room to stretch out and want to avoid the city markup of the hotels, this is the place to stay. Would definitely stay here again.